The Lightning put together a pretty good game last night. They had a lot of jump at the beginning, and they managed to keep the lead to the end. It's nice to see that happen. Ramo had a great night. I think it's interesting how goalies tend to do better the more they play. It makes sense, tho, if you think about it. I mean, if you're in that mentality of having to play every game and needing to improve upon your last performance, then that's probably more helpful than to play once every week or so where you start thinking too much about things. It was a solid effort by the entire team. It seems to be something that this team hasn't been able to do - for whatever reason - this season consistently. But when they are able to do it, then they tend to either stay close or win the game. They did that before the trade deadline, and it's still going on now. My one pet peeve all season, tho, has been a lack of shots on goal. I mean, I'm all for playing well defensively, but if you don't have the offense to back it up then it doesn't usually get you very far. Tampa Bay got very lucky in the third period with only 3 shots on goal. I'm of the opinion that you can never have too many shots on goal. I was having a similar discussion about college basketball last night. My pet peeve for men's basketball is that no one does offensive rebounding - and barely does any defensive rebounding. All the guys on the court just admire the shot, and if it doesn't go in they're not sure what to do. It's nuts. Of course, when I played basketball in high school, rebounding is what screwed up my ankle - because I kept landing on other people's feet. But that's another story, I guess. Okay, I have a confession to make. I was watching the UNC-WSU men's basketball game while listening to the Lightning game. I was O-fer on the night, tho. I'd picked WSU in the upset, and Tampa Bay winning as well. A friend of mine is both a UNC fan and a Washington Caps fan, so I ended up losing all bragging rights on the night. Oh well, what can you do? Not that I'm a WSU fan or anything. I prefer UW of the two major Washington State schools, but whatever. That's a whole 'nother story. And we're here to talk hockey, anyways, right? I thought that the Lightning kind of had a slow start. The first period was more defensive than anything else, it seemed (or was that the first half of the basketball game...?). It picked up in the second period, tho. And - I was reading the papers today (by the way, congrats to Tortorella & Sullivan for being named to the Team USA World Championships coaching staff), and Tortorella wasn't very happy with play in the third period. Yeah, it could've been better, but they played their best under the circumstances. I'm sure it's frustrating as a coach to see that sort of thing happen repeatedly, but such is life. The scary part of the evening happened in overtime. The reason for the goal scored was that Boyle was taken out of the play. And Boyle was taken out of the play because he got nicked with a skate blade in the neck. Fortunately, he didn't even need stitches for the 4-5 inch cut, but still. Boyle can't seem to catch a break this season. First, it was the freak skate falling accident that cut open his wrist during preseason - for which he had to have surgery. Then he comes back only to have to have surgery again on the same wrist for the same injury because things hadn't healed quite right. Then this last week he gets a skate boot in the helmet during practice, followed by the skate blade cutting his neck. Maybe someone's trying to tell him something...? I don't know, but maybe it's lucky for him that the season's almost over. He should probably turn down any invitation to World Championships, too - just in case. You just never know where something like that might lead, so it's probably better to play it safe and lie low for a while until it passes over. It's nice to see the Lightning winning - and I don't care what their situation may be in regards to playoffs. Winning is always preferable, and, of course, fun. And it's always nice to end the season on a winning note as well. The guys that were brought in at the trade deadline have been doing very well, I think. They've managed to blend into the team, which is something that doesn't always happen. Sometimes it seems as if Smith has been on this team for the entire season. The first period was good. The team had jump and seemed to be pretty motivated. And then the second period happened. Suddenly, the Panthers had everything going for them. The drastic changes from period to period ought to be looked at. And I mean that in both a coaching and a player's psychology kind of way. I mean, it's like Jekyll and Hyde, and last night's game is a great example of that. Tampa Bay plays well for the first and third periods and then daydream for the second period. And that's truly what has killed them this season - these severe mood swings from period to period. After having said that, obviously the third period was pretty good as well. What did the Lightning ever do before acquiring Jeff Halpern, huh? What's funny to me is how the radio announcers will talk about Halpern's checks. They talk about how he drops his shoulder when he hits a guy. He's American, if you didn't know, and it sounds like he's hitting like a football player. Football players are taught to drop their shoulder into the midsection of guys when they hit. I'm not saying that Halpern does that exactly since I don't think you can't really do that in hockey so much (other than maybe during a faceoff), but to hear the radio announcers talk, it sounds like they think he does. I've made it back to join you for the last 7 games of the season. Moving, new job, and internet connections have made me miss a lot, I know, but I'm back and I'll be finishing the season up with everybody. Look for my newest blog on the Lightning tomorrow evening. Have a good one! Tomas Vokoun got all the praise and reached a milestone in the Florida Panthers' latest win. Vokoun stopped 35 shots, and the Panthers kept working toward a playoff spot with a 4-2 victory over the Tampa Bay Lightning on Saturday night. "He had an unbelievable game. Better than great, unbelievable," Tampa Bay forward Vincent Lecavalier said. "He came through time and again in the clutch." The Lightning fell into a tie with Los Angeles for the last spot overall in the league with a third consecutive loss, but still occupy the No. 29 spot based on Tampa Bay having played one fewer game than the Kings. "I don't know why that is, certain buildings, for whatever reason we struggle in," defenseman Dan Boyle said. "I have no beef with how hard the team played, we just couldn't score," Lightning coach John Tortorella said. "I thought we dominated most of the second half of that game. Vokoun was the difference. That's why they have won so many games here 8-0-1 on their little run. He's played that well." Now, what was I saying again about Lecavalier and hat tricks about a week ago? Does this mean that he's going to make a push for the Art Ross? Gotta hope so. It'd be nice to see someone salvage something out of this season. And I think it's totally doable. Wow. Was it really only a week ago I saw these guys play in the Forum in Tampa? My, how time flies when you're middle of insane craziness. Obviously, this was a great game for Tampa Bay, as shown by the 8-4 score. And when you're winning, particularly by a lot, that's usually a fun time. I was very happy to hear about that. I think it's just what they needed. This team deserves to have a little fun after the last couple of months that they've had. I think this was a pretty solid game from beginning to end. They had the one thing that they've been lacking for a while now - drive. They played like they really wanted it, and did what it'd take for them to win it - and then some. They've got nothing to lose at this point, so I think they should go for it and have fun. And why not? Isn't that why we all watch, coach, and/or play the game anyway? Because it's fun? It's a drag to watch an 82-game season, and I love the game, so I'm sure they've just got to burn out at some point themselves. After all, I'm just watching; I'm not eating, living, breathing, and playing the game. Since I'm now here in Virginia, I'll be catching games strictly over the radio - whether thru my computer or on satellite radio - and catching video highlights later on. So right now I'm trying to decide the best way of going about this. Do I write right after the game, or do I wait a day until I can see things for myself? I'll trying one of each and then figure it out, I guess. Hmmm. I'm seeing a theme here, and I don't really care much for it. For the third game straight, the Lightning have lost the game at the bitter end. Three games ago, it was in the last 4 minutes of the game. Two game ago, it was in the last 2 minutes of the game. This game, it was the last minute of overtime. Do you suppose that the next game they will lose in the shootout? Okay, just being funny there. Please don't do that. I feel bad for the goalies. I mean, they get the loss counted against them, but it's not as if they can score. But it's the same thing with pitchers in baseball, I guess - in the American League, anyway. Obviously, finishing is the problem. They're playing well enough defensively to stay close in games, but they aren't able to close the deal at the end. The follow-thru and intent are there, I think, but not the desire or the drive. It's a very hard thing to play for just pride, but no one ever tells you that. I have an idea about how it goes. I spent a basketball season in high school where we won just one game all year - and we played a 35-game season. (I was a center.) We rotated thru captains, and I was named captain about a third of the time. We went thru those periods of frustration, exasperation, and despair. The coach tinkered with everything that he could think of, too. In the end, we just played for fun, and we did so much better for it. Of course, it wasn't our jobs to play, so there wasn't as much on the line if we won or lost. Nothing but pride, anyway. It sucked, but what could we do? By the way, I prematurely changed my location. I haven't left Florida yet, but I was planning to tomorrow. However, Mother Nature had other plans, and a serious rain storm prevented me from finishing up packing and storing the last few things I have here. Never-ending torrential downpours and cardboard boxes just don't mix, for some weird reason. I will be leaving on Sunday, and luckily I have satellite radio, so the Lightning will be keeping me company for part of the long drive up to Virginia Sunday afternoon while they visit Columbus. Not sure if I'll be able to write on that game yet, so stay tuned. I know what you're thinking. You're thinking that the Lightning have given up on the season - not playoffs, which are just out of reach right now - but that they're just are done playing. I disagree. The scores aren't indicative of the games. Sure, they've lost seven out of their last eight, but four of those games were right before the trade deadline, too. And we all know how teams and players get right before the trade deadline - because no matter what they themselves might say, it really is a distraction. This game had its moments of brilliance for the Lightning. It also had its share of "what were they thinking" moments, but that's the way it goes for most games. I think Ouellet stepping up his play and scoring more is great. With Gratton out, Ouellet's been playing very well. I'd seen Picard play in Philly last year, and he's a really good defenseman. He was one of the bright spots in an otherwise dismal season for them. Next up is Jersey. You know, I've done that drive up the New Jersey Turnpike between Philly and the Meadowlands. It was one of those joyous times where no one was doing a constant speed, so I couldn't use the cruise control on the car I'd rented. That was fun. The trip back to Philadelphia wasn't so bad, tho. This was last year and I'd wanted to see the Devil's play at the Meadowlands one last time before they moved into Newark. The first NHL game that I went to was at the Meadowlands, if you can believe that. That game was awesome - I had so much fun it was practically indecent - and there's absolutely no way that I could ever explain why I enjoyed it so much to anyone else. And then I got to go back to Philly afterwards, which was nice for me since I really like that town. All in all, it was one of the better days I've had in my life. 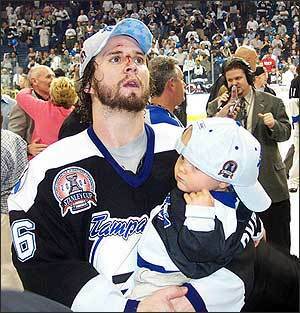 The Lightning lost another heart breaker last night. But, you know, I thought that it was a pretty good game. Sure, they lost in the last 5 minutes of it, but to keep both Crosby and Malkin off the scoreboard for 55 minutes isn't a bad thing. I went to this game - one last home game before I have to go this weekend - and I thought the Lightning did a pretty good job. The first 10 minutes were a little shaky for them, and the last 5 were as well, but the game overall was pretty well-played defensively. They were aggressive, they played with emotion, they shot the puck - pretty much all you needed to do to win games except score. It's not their fault that Fleury was having a great game. Lecavalier was having a rough night. I think not scoring a goal for 9 games previous is really starting to get to him. He's hesitating on shots, and second guessing his decisions - in general, he's just thinking too much about it. Shooting should be instinctive, and thinking about it just slows you down. He has a great shot, so he should use it. Maybe now that all of the team-related distractions are finally gone he'll have a better time of it. I look at his scoring problem in one of two ways. One, you can work on your other skills until the shooting comes back around - which, in the end, can only make him a better player. And/or two, shooting is pretty much like passing in traffic. You're trying to get the puck to where you want to go in either case, and usually thru a small space both ways, so instead of looking to get something past the goalie he should be looking to hit the netting. It's a small but significant change of focus, and Vinny's passing is still going great - I saw last night. I have no doubt that he'll start getting hat tricks left and right again soon. And who knows? Maybe he'll even manage to win the Art Ross by the end of the season. Stranger things have happened. Wow. Mere words cannot even describe what I think about this game. Unfortunately, you can't see me waving my arms or hear the indignant noises to go along with my blog, so words are going to have to do. Keep in mind that I have very little patience, and a really low threshold for bull these days on top of that - unless it's the funny kind, then that's alright. The Lightning are soo lucky that Tortorella is their coach. If I was, I'd make him seem like a very nice man. It wasn't entirely their fault that they lost. I mean, Carolina had lots of help from their friends in the striped shirts. (I wonder why they didn't get called for too many men on the ice with that.) The fact that Carolina had a total of six powerplays, four of which came in the second period alone, to Tampa's one powerplay is rather convenient for somebody. I'd love to quote a guy I knew in college who once made a comment about referees and their knees, but I don't think it's appropriate for mixed company, and certainly not for children. It's very true, tho. Funny, too. The Lightning started out well enough - for once. As events started spiraling out of their control, they just started going thru the motions - with little emotion. Sure, you'd get those impromptu informal get togethers when the whistle blew, but I think that was more out of habit than out of any real intention to do anything. Seriously, when things are spiraling out of control, you don't just sit there and wonder why that is and hope that somebody else will take care of things or point you in the right direction. You try to take control yourself (or at least the leaders on the team should be doing that) and make something constructive happen. But, of course, nobody stepped up to do that. And, really, when things are desperate (such as a 5-1 score with 15 minutes left in the period! ), you don't just go thru the motions. You take calculated risks. You do what you need to do to get where you want to go, and you be creative about it. You don't sit on your hands and call it a game. Okay, I'm going to stop now. I'd like to tell you how I really feel, but I think it would be best if I stop while I'm ahead.